Photo Caption: PASA AfterZone educator Victor Terry with PASA students at Harmony Blueberry Farm. This summer, SCLT continued its collaboration with Providence After School Alliance (PASA). PASA is a non-profit organization in partnership with The City of Providence and the Providence Public School District. Their programming is designed to improve after school and summer opportunities for the young people of Providence. SCLT was proud to work with PASA’s AfterZone middle schoolers from south Providence for four weeks in July. 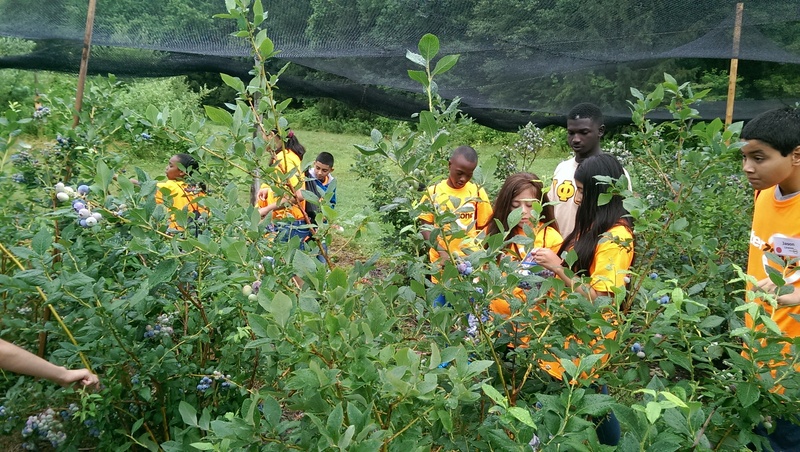 SCLT’s Program Associate, Joemily Collazo, led a STEM-based (science, technology, engineering, and math) curriculum with the students through the lens of urban agriculture. They learned team building and working effectively in groups. They learned how to identify the different types of plants that grow on a farm, where they should be located, and how to measure their growth. They learned the importance of bugs, their various types, and their roles on a farm and part in the larger ecosystem. They studied the impacts of water, temperature, and weather systems for farms, their insects and animals. And on the last day, they had a SNAIL RACE! It took over an hour and the boys snail team beat the girls snail team by an inch and a half! Thank you to everyone at PASA and most importantly, thank you to all of the kids who participated in our program. It was educational, but more importantly, IT WAS FUN! On Saturday, August 9th, from 3pm to 7pm, Walrus & Carpenter Oyster Farm is having an oyster feast and tour whose proceeds benefit SCLT. The event is sold out! What a great way to enjoy all of the summer offerings in Rhode Island.